Posted on January 20, 2017 at 4:26 pm. 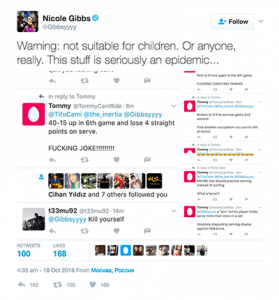 Gambling has taken a hit not just for having a presence in sports, but for causing professional tennis stars to be cyber-bullied. Cyber-bullying is not to be taken lightly. It causes psychological damage and has been the cause of the demise of many stars and everyday people. And now the New York Post are suggesting tennis players are blaming gambling sponsorships in the sporting industry for the increase of cyber-bullying. But if you take a look at the removal of bookmaker William Hill on-court sponsorship by Tennis Australia at the Australian Open, you will realise this blame has been incorrectly shifted. Abuse still occurs, and while it is on the rise, it isn’t the fault of gambling. Just take a quick look at Nick Kyrgious’s Instagram following his loss at the Australian Open, which didn’t advertise gambling, and you will find at least four or more comments which amount to cyber-bullying on his latest image. Social media enables trolls to leave abusive comments. In the article on The New York Post which outwardly blames gambling sponsorships for the abuse, the author included the horrendous and cowardly comments from people all around the world on an American tennis player’s Instagram. But on closer inspection these awful comments came following the loss to Angelique Kerber in the WTA finals in Singapore. Given this event had no gambling sponsorships whatsoever the link drawn is surprising. “It is really disturbing to me,” she said. This was paired with screenshots of abusive tweets she received last year following a loss in the first round of the 2016 Moscow Open. Trolls abused her and even went so far as to say “kill yourself”. This is despite Russia having strict anti-gambling laws, meaning sponsorships aren’t advertised here perhaps blurring the point the author was trying to make. 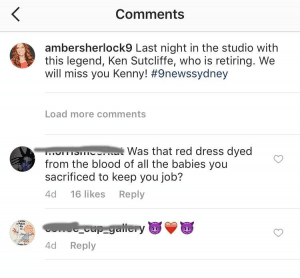 Journalist Amber Sherlock faced an immense about of abuse after the white shirt scandal. If the author was intending to perhaps suggest online betting sites were the problem, and not sponsorships, this can be easily looked at by comparing an industry which doesn’t allow outcomes to be wagered on. Let’s take the journalism industry. You can’t wager on the outcome of a front-page story, but head to the journalist’s Instagram page and it is guaranteed bouts of abuse from trolls will be filled in the comments section regarding the article if someone didn’t like their work. As more and more sports withdraw from gambling sponsorships, it will be interesting to see where the blame shifts for the increase of cyber-bullying, instead of tackling it head first and addressing the real issues.